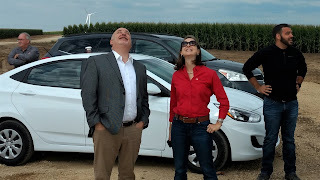 The RENEW Wisconsin team got an up-close view of the Wisconsin Quilt Block Wind Farm on August 24th. 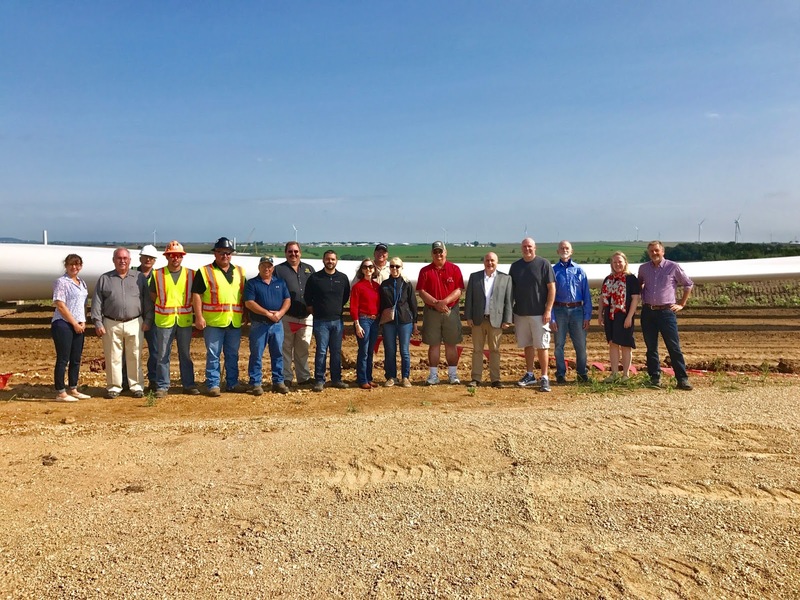 The wind farm, developed by RENEW business member EDP Renewables, is located 50 miles southwest of Madison in Lafayette County’s Seymour Township. 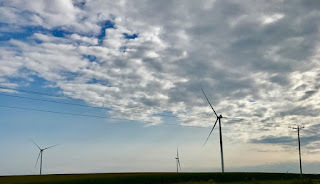 The turbines compliment the area’s sprawling corn, wheat, and soybean fields and provide local farmers with a stable cash crop in the form of landowner lease payments. We drove about an hour and fifteen minutes from Madison through the beautiful rolling hills of southwest Wisconsin. About 10 minutes from our destination, we caught our first glimpse of the striking wind turbines in the distance. 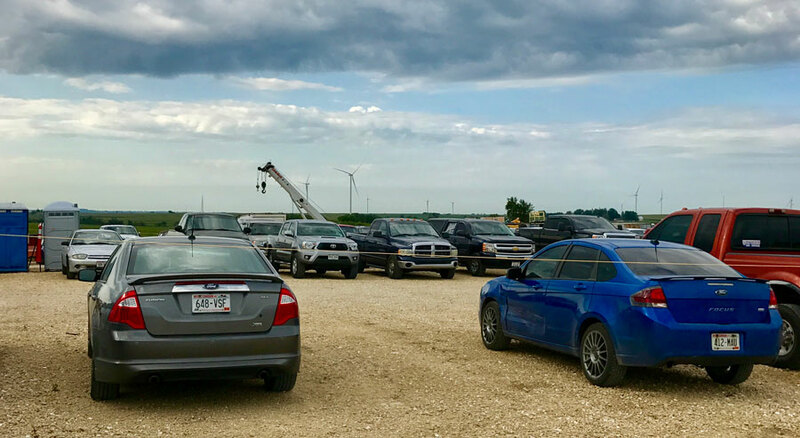 When we pulled into the lot where the project offices were located, we were all struck by the impressive number of vehicles and people going about their work, a testament to the 100 full time jobs created during construction. The wind farm will also offer 12 permanent jobs during the life of the project. 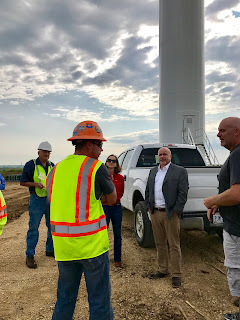 We entered the on-site offices and were greeted by a very friendly project team and other invited guests, including U.S. Representative Mark Pocan, whose congressional district includes the new wind farm. We also heard from local leaders who were proud to show us the project and share their great experiences working with the EDP team and others. 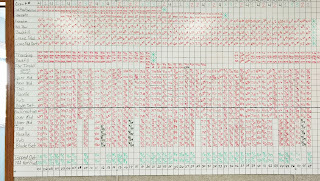 The project is intricately tracked on a white board in the job site trailer, with each turbine listed along with process steps and status. 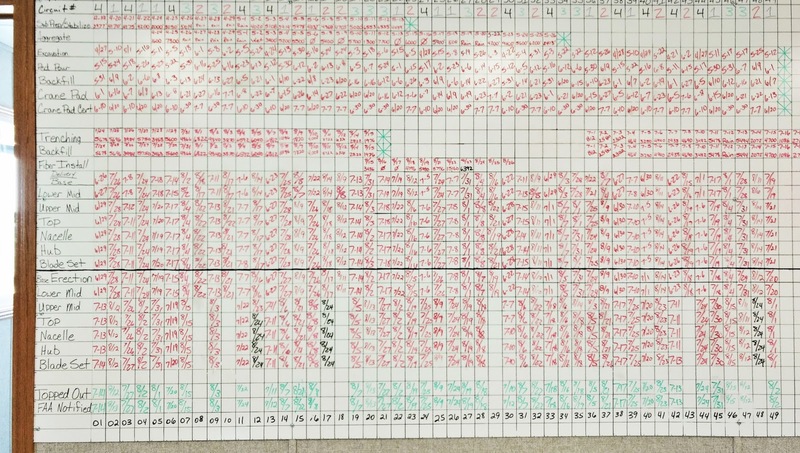 We learned that 41 of the planned 49 turbines had already been erected or "topped out," putting the project ahead of schedule. After enjoying coffee and donuts, we piled into several pickup trucks for the short drive to one of the turbines that had recently been erected. Our guide Chris, an inspector and surveyor who oversees the construction of the concrete bases for EDP, gave us a quick safety talk, then gamely answered all of our questions about the construction process. One big surprise? The ‘top-out’ process, where workers use cranes to hoist a nacelle and blades atop each tower, is completed for each of the 49 turbines by a single work crew of only a dozen people. We were impressed by the efficiency. 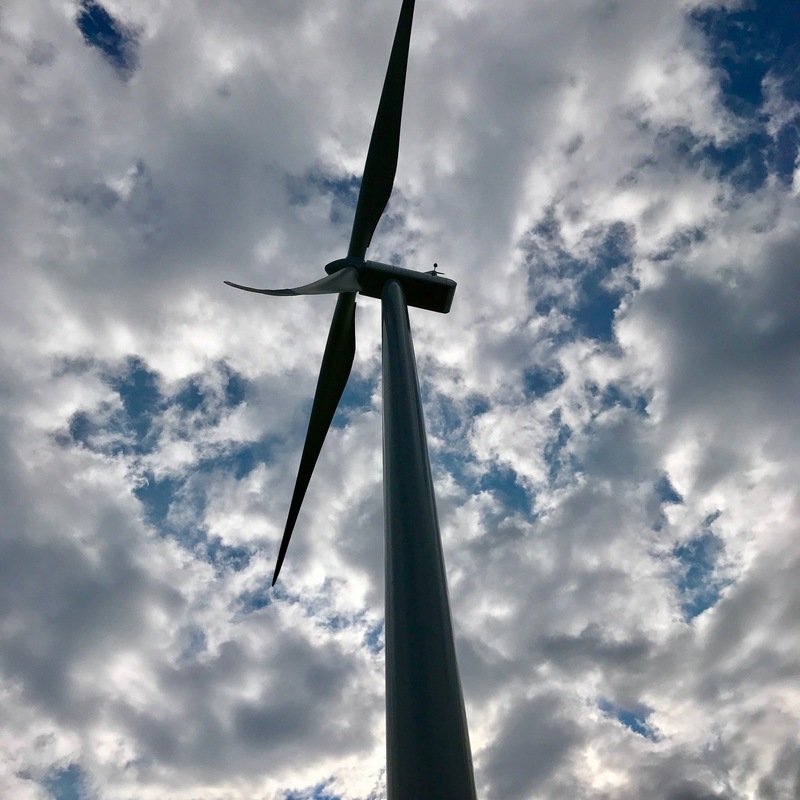 On site, we stood directly beneath a recently-constructed wind turbine, towering above us. As lovely as it was to see the turbines in the distance, this was even more majestic. We were overwhelmed by the size and beauty of the turbines. Tim McComish, the Chairman of the Town of Seymour and a 5th generation local farmer said he did a lot of research when the wind farm was first proposed. He was concerned that the turbines would ruin the landscape. “I love how they look,” he said. 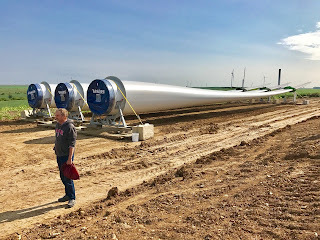 At our next stop, we stood beside a tower with its nacelle and 3 blades on the ground, waiting to be hoisted by two large cranes later in the day. Standing next to three enormous turbine blades, the size and perspective was mind-blowing. 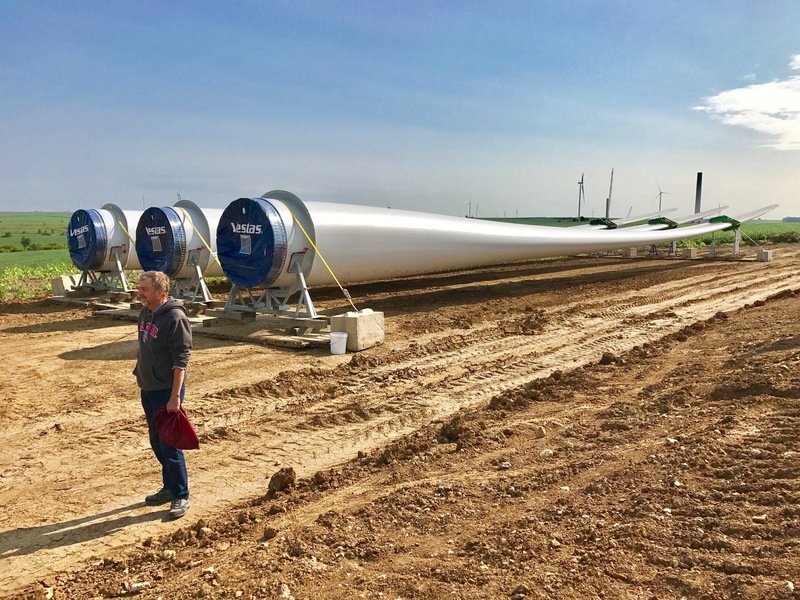 The blades and nacelles on these impressive structures can actually be raised and assembled in 3 to 4 hours, if the wind conditions and weather allow. RENEW toured the project along with a number of local officials including Tim Burgess, a Supervisor in Seymour. He is supportive of the wind farm and enthusiastic about the benefits it will bring to the local community. "Any farmer or community who tries to keep a project like this out of their area is crazy," he joked. Burgess is also one of the 44 local land owners who are leasing land to the farm. He was impressed by how efficient, professional, and considerate all of the contractors on the project had been. 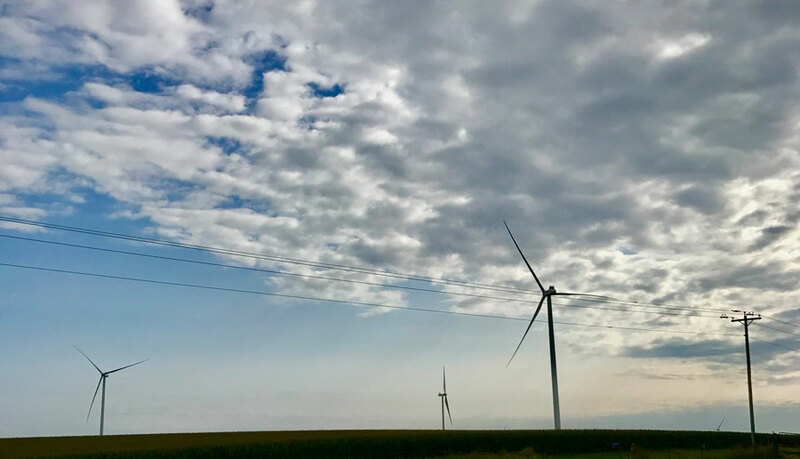 When finished, the 98 MW wind farm will produce enough clean electricity to power more than 37,000 Wisconsin homes. The energy will be purchased from Quilt Block by Dairyland Power Cooperative. This wind farm represents a capital investment of approximately $167 million. About $400,000 in revenue every year will be generated for local governments, divided among the county and towns. For the Township of Seymour, where the wind farm is located, the $150,000 they will earn each year is bigger than their current annual budget, and they are eager to put the revenue toward new projects and improvements to local roads, according to Vanessa Tutos of EDP Renewables. Why Quilt Block? We learned that the wind farm’s name references the barn quilts of Lafayette County. Barn quilts are painted wood or metal quilt blocks mounted on barns or other buildings and celebrate the area’s agricultural heritage. 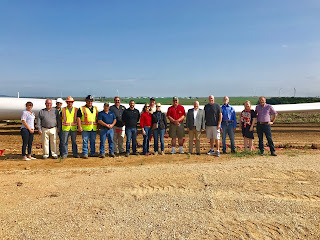 We’re grateful to Vanessa, Wayne, and everyone at EDP Renewables and the residents of Lafayette County for their hospitality. 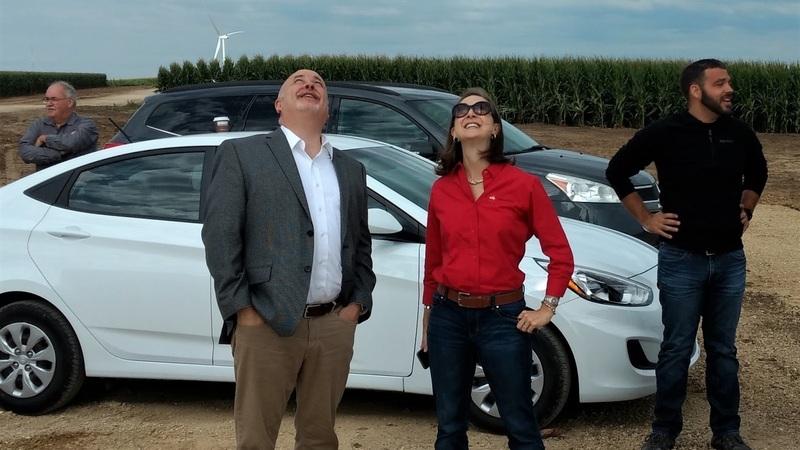 We’re also glad we had the chance to talk with U.S Representative and renewable energy proponent Mark Pocan. It was a privilege to see first-hand the beauty and benefits of this amazing wind farm and to meet the team that made it possible.